Vancouver, B.C… Corvus Gold Inc. (“Corvus” or the “Company”) - (TSX: KOR, OTCQX: CORVF) announces the last four holes of the 2016 phase I drill program and the start of its phase II drill program (Figure 1). A total of 6,250 metres of Reverse Circulation (RC) drilling was completed during Phase I. Drilling was concentrated around the Swale target located at a major intersection of the northwest trending YellowJacket zone and the northeast trending NWSB zone. 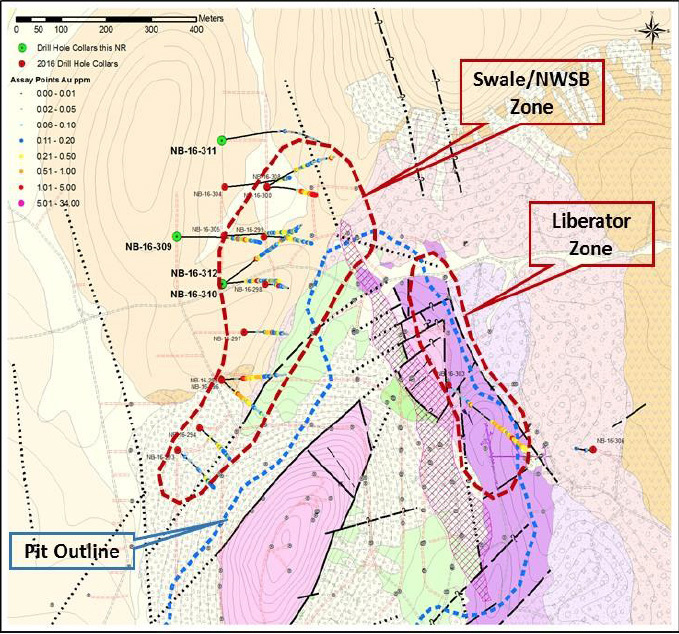 Results have returned a number of higher grade (+1 g/t gold) structural zones within a 500 by 200 metre target area. Latest results from the phase I drill program include NB-16-310 with 13.7m @ 1.18 g/t Au and NB-16-312 with 4.6m @ 1.08 g/t Au & 6.1m @ 1.2 g/t Au. All four holes were within the Swale target and included two holes which intersected broad zones of +1 g/t gold that were surrounded by thick low-grade zones along north-south trending structures (Table 1). This large area of low-grade mineralization is prospective for additional mill grade mineralization and lies immediately north of the current pit boundary design. This target area will be an area of focus during the Phase II, resource development drilling scheduled to start this month. Figure 1. Drill hole locations map for 2016 phase I, North Bullfrog project. Two of the final four holes drilled in the phase 1 program targeted the northern extension of mineralization intersected in hole NB-16-298 (23m @ 1.69 g/t Au, NR16-09, June 7, 2016) and returned encouraging intercepts such as NB-16-310 with 13.7m @ 1.18 g/t Au and NB-16-312 with 4.6m @ 1.08 g/t Au & 6.1m @ 1.2 g/t Au. These intervals are surrounded by over 100 metres of low-grade mineralization indicating the system remains very strong to the north of the currently defined Sierra Blanca/YellowJacket deposit. The current interpretation of the higher grade mineralization in this area indicates it is controlled by a series of north and northeast trending structures and structural intersections with the major northeast structural zone hosting the mineralization in hole NB-16-298. Hole NB-16-309 tested the Swale system 200 metres to the southwest of hole NB-16-300 (18m @ 1.8 g/t Au, NR16-09, June 7, 2016) and returned several broad intercepts of low-grade mineralization including 65.5m of 0.40 g/t Au. This broad zone of gold mineralization from the currently farthest west hole drilled in this area, indicates the system remains open and suggests that potential exists in this direction for other feeder zones. Holes NB-16-311 was drilled north of prior hole NB-16-308 (3.1m @ 2.24 g/t Au, NR16-11, August 2, 2016) but failed to hit the favorable host rock package or any significant mineralization. Corvus Gold will begin its 2016 Phase II drill program later this month. The program will involve approximately 6,000 metres of reverse circulation drilling designed to address resource expansion potential for the Sierra Blanca/YellowJacket deposit to the north and west in the Swale Zone and to the east in the Liberator Zone. In addition, two new exploration/new discovery targets will be tested at North Jolly Jane and Cat Hill. The program is planned to conclude by mid-December. All of the planned exploration and development programs for 2016 and 2017 as well as corporate costs are fully funded. For additional information on the North Bullfrog project, including information relating to exploration, data verification and the mineral resource estimates, see “Technical Report and Preliminary Economic Assessment for Combined Mill and Heap Leach Processing at the North Bullfrog Project, Bullfrog Mining District, NYE County, Nevada” dated June 16, 2015 as amended and restated May 18, 2016, which is available under Corvus Gold’s SEDAR profile at www.sedar.com.